To all my fellow educators, especially those who are in leadership positions and/or the teachers of reading, literacy, ELA (or whatever it's called today), please take note that some of the practices we are employing in our schools, specifically as they relate to student reading, are actually killing the love of reading in our kids. 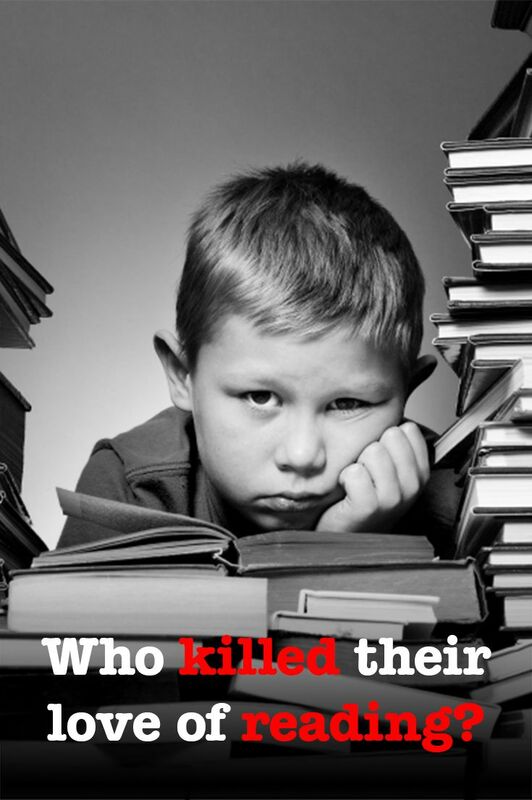 It's true - in our effort to "educate" kids and to make sure they are "college and career ready," we may be indirectly killing the love of reading that many of our children come to school having nurtured (with the help of family members, other readers, etc.) through their own book readings and explorations. 2. Written responses... that were never checked or responded to. Yes, I do recognize that children should write about their reading but that writing should be used to give us insight into their thinking as readers so we can help them grow. 3. Summaries... ugh... 5-8 sentences where Paul summarized a book he had read just so a teacher could hold him accountable. It became such a chore that Paul always wrote the minimum and sometimes found a summary using Google that he could paraphrase because it didn't matter to him. 4. Book reports... the dreaded book reports that really became more about drawing some amazing picture to go on the cover of the report than anything else. They were also so formulaic that little thought went into completing them - it was like mindlessly following a recipe. 5. Reading passages just to answer multiple choice questions... why are we doing this to our kids? Paul got to the point where he would just read the questions and the multiple choice answers and then scan the passage for the correct answer - no reading really involved there. 6. Close readings have turned into reading the same book for months and doing endless assignments around that one book... that doesn't work for every kid. The list could go on and on but the point is that somewhere along the line the reading Paul was doing became more about meeting someone else's expectations than they were about nurturing and growing his love for reading. I saw it last night when doing a homework assignment related to reading became a challenge that he just wanted to finish and move on. Yet, when the time came for him to read before bed (we agreed to 15 minutes) he literally begged me to stay up to read because he wanted to see what happened at the end of the book. 15 minutes quickly turned into 45 minutes and in the end I had to wrestle the book out of his hands because he needed to sleep. Why do I share this? Not to shame any educators or schools (Paul has had some of the most amazing and talented teachers I have ever seen) but to just point out that we must rethink our practices as they relate to reading because they might be having the opposite impact - not creating better readers but instead creating resentful readers. 1) Let kids just read what they want to read; choice is a powerful incentive. 2) Let kids talk about what they are reading... book talks are awesome ways to hook other readers and spread book love. 3) Don't attach an assignment to every reading activity. 4) Books don't have to be the only thing kids read. 5) If an assignment has to be attached to a reading activity (for accountability purposes), give the kids choices about what they might do. 6) Confer with kids - talk to them about what they are reading and use that data to help our kids set their own reading goals so they get better. 7) Don't make kids read one novel for months at a time and if you must do this, make it engaging! Again, the list can go on and on and there are educators who are much more skilled than I am who could offer much better insight but this is just a plea from a dad who wants his son to continue to love to read. No, this is not a new plea as it has been written about here in the Washington Post, and here by Pernille Ripp, and here by Mark Barnes, and even here (there are dozens of pieces actually - just visit the Google). Educators have been talking about killing the love of reading for years yet we are still employing many of the questionable practices and I think we are doing it all in the name of accountability, test preparation and standards. While I recognize that those are our realities, and we must work within them, I hope we (all educators) can pause and reflect on the practices we are employing to ensure we are not indirectly killing the love of reading in our kids and instead we are helping grow that love of books and reading! Wow. Great post. I feel as if this conversation is happening in so many districts but the structures that exist to "assess" reading still exist. In my experience, it is almost as if it is up to the teacher to decide if reading logs are used, summaries, and everything you outlined. At what point, do we take away the practice that doesn't make sense? There are teachers who are using apps and sites that have made the reading log digital and awards points based on it. Ridiculous. How do we as leaders ensure the love of reading is fostered and not destroyed by forcing students and parents to log their reading? Are we that controlled by having to put a grade in the Parent Portal? No reading logs! Done. Over. Nailed it. I remember book reports. They killed my love of reading. I might as well have been processing insurance claims. Given this was a factory town with a factory school system geared to producing factory workers, that was the kind of work I was being prepared to do. I escaped. The town became one of the rustier places in the rust belt. Thanks for this post, Tony. As a parent who is working very hard to nurture my daughter's love of reading, I'm grateful for you taking the time to identify these issues. 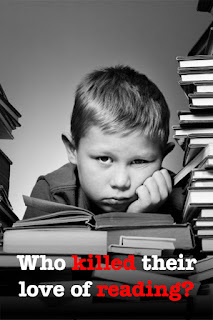 I would certainly agree that most educators don't want to be killing the love of reading for kids. And yet... so many school reading-related activities do have that effect. I would love to see your post get a wide response!! Our grade level got rid of reading logs this year. Best thing we ever did. Only one parent wanted me to do a book journal with their kid, which I am doing, but for the rest, there was no going back. Student-run book clubs seem to work very well and the students rise to the occasion with the ownership and responsibility of assigning themselves the work. This is a great post. What a great idea to have student-run book clubs. I always think word of mouth is a great way of learning about new books - that's probably why Goodreads is so popular. Students who have similar tastes in books can also get together and "compare notes." As an educator, I have really tried to focus on reading for enjoyment this year. Instead of keeping my ELA block so structured and assigning work to go with every single word we read, I have given my kids more choice. We have daily discussions and I can quickly teach a strategy to help improve their reading on the spot. (Without worksheets). My kids spend equal time in the day just reading for enjoyment and I have seen more growth this year than any year before!! Your article is right on and it is so sad to see kids dread to read. Kuddos to you!!!! P. S. don't get me started on the endless computer programs they are pushing on the kids now!! That could be a whole other article. Loved your post and am so happy that this conversation is happening more and more. A love of reading is something to be shared and much of our accountability measures do not generate conversations about books or give the reader an outlet to inspire others to read a great book. I wrote a post called "Ten Ways to Ditch That Reading Log" http://www.middleschoolmind.com/the-teachers-blog/ten-ways-to-ditch-that-reading-log I hope others can get some new ideas for supporting readers in a more authentic way. Thanks for sharing. I don't think you realize how much of the curriculum the teachers have control of. I have NO control at all, due to common core we are given a workbook that we must use that includes reading logs and close readings. There is no flexibility in this, we are told what to teach and how to teach it. Please don't assume the teacher can change the way reading is assessed, because of common core somethings just have to be assessed a specific way to keep with the standards. How do you make sure every teacher in the country is assessing the same standards based on verbal conferences? Also the time it would take to do 75 conferences isn't realistic. Just keep these things in mind when you are pointing fingers- point them at the right people. In what state is this occurring? Do you have a teacher's union that values your education and highlights that in creating teachers' rights in the classroom? Sticking to prescribed workbooks does not allow for the differentiation that is needed in most classrooms. I know that at the primary level there are several predetermined steps in the primary grades, however, assessment can be performed as a teacher on many levels, and only requiring one performance assessment for terms of common core "grading." Please look into your rights as a classroom teacher in your district. And also look into the ways to assess for Common Core. Common core asks that children respond in multiple ways and rarely states individual completion. That is often a district misinterpretation. What state are you teaching in? Do you have a teachers' union that values your education and knowledge of teaching? What you write of is not only not accessing common core standards, it is not allowing for the differentiation that is needed in classrooms. I understand that in primary grades there are multiple assessments that teachers must do, but if you look at the spirit, and in some cases the words, of common core they do not need to be done in isolation or in writing. Much of Common Core is asking for teachers to create communicators. Long time research has shown that verbal skills rise before written skills, and speaking before reading. Assessing students verbally does sound overwhelming, it is how I felt when I was first given this task with 240 high school students. But you do not have to do it individually. Vygotsky wrote of proximal development, and this requires group and guided settings that allow for students to show what they can do as a whole not in a stressed isolated moment of time that only assesses what they have mastered and not what they can do. Please look into pushing your district to move from a tight curriculum that does not look at overall development but only to create boxes of children. Common Core has taken a bad wrap in that people see these boxes that were created by districts (because they are easier to judge) than the true intent of creating curriculum that looks at the building blocks that bring students to the mastery level. Even districts with teacher's unions are dealing with what amycrista described. Teachers unions get teachers a fair salary, retirement, and keep class size down. They don't do much else. 75 conferences? If I met with each of my students that would be 260 conferences. So, no, that doesn't happen. I do give lots and lots of choice in reading. Hi Amycrista, I would encourage you to read Kelly Gallagher's book, In the Best Interest of Students and Penny Kittle's Book Love. Kelly spoke here recently and explained how he conducts reading conferences with his students in high school. 10 minutes a day with 3-4 students. Penny Kittle does something similar. Kelly explained that he is able to conference with all of his students in about a week and a half to two week period. Makes a huge difference with students. Teaching Common Core Standards doesn't mean you have to use specific materials. That is a choice made at either a school or district level. I teach ELA using a myriad of novels, magazines, excerpts from nonfiction books, and picture books among others. The skills prescribed in Common Core State Standards can be met in various ways. Teachers being forced to use a workbook or textbook stamped with "Common Core" is the unfortunate result of school boards and curriculum directors not being educated in best practices and looking for an "easy fix" so they can check CCSS off their list. I encourage you to speak with other teachers in your district or school and get the support of your teachers union. Adults don't read textbooks and workbooks - it's ridiculous that we would expect that teaching kids to read with them would inspire a life-long love of reading. I taught school eons ago, and traded my credentials for an academic librarian job, so obviously reading and research is an important part of my life. I taught before all the tests took over what we taught kids and I and my teammate wrote into our lesson plans times every day for either letting the kids read a book of their choice with no "assessment" - just pick a book and read and we read daily out loud to them after their noon recess - it calmed them down for the afternoon studies and also awakened love for books they might not have read otherwise. I remember the same thing happening in school, particularly elementary school, when I was a kid. However, these days everything must be assessed and every precious minute of the school day must have an activity that is assessed. I think most schools would find their students do better with some unstructured free time for reading and with more recess time to give their brains time to renew. Of course, I'm also for getting rid of all these state assessment tests because they don't teach students how to think critically or problem solve - just how to fill in bubbles on a scantron. I like so much what you say but i think the teachers have no rôle in Killing the love of reading because they have à programme to finish. At the end of September, I resigned from my ELA job of 11 years and pulled both my daughters from the same district after I found out my own peers had chosen to stick my 9 year old daughter on an ipad computer program to gather testing data rather than provide her with quality reading time which I had suggested. I lost faith in the education system and will not be sending my kids back. The quest for data and scores has BLINDED educators. Now I am home schooling my 6 and 9 year old daughters, and I am grateful that my family is in a position to do this. Teachers, I highly recommend you read "The Book Whisperer" and "Reading in the Wild" by Donalyn Miller. It will change the way your run your ELA curriculum forever and for the better! I'm a professional secondary reading interventionist and I abandon reading logs long ago, mostly because an overwhelming amount of research shows that they actually decrease motivation. It's just not best practice and there are better ways to hold our students accountable to reading and encourage high-level thinking and reflection on their reading choices. The closest we come to reading logs in my class is a Reading List where the kids write down what they're reading, when they started and finished it, the genre, why they chose the book, and a star rating. That's it. It takes 45 seconds to do. Resistance to reading has dropped dramatically in my class since I instituted that. I don't allow reading logs in my house for my own kid for the same reasons and it's never been an issue when I explain to her teachers my rationale and the research behind my decision. I'm a public librarian who was going to make a recommendation for the book, The Book Whisperer, also. Now I'll look for Reading in the Wild. I'm hoping to institute some programs to encourage reading soon. Wow! I have being saying similar things from a public librarian's standpoint for years. My husband taught English and loved the literature and the students. Teaching to the standards and with technology eventually killed his love of the profession. Many times I have asked why can't we give kids more time to just read for pleasure. We saw this love/hate relationship with reading happen in one of our own children as more and more reading comprehension demands were placed on her in secondary school. She has since graduated from college with a major and 2 minors, but will still express hate for reading. She actually has an outstanding command of the English language, but lost interest in reading as she became overwhelmed with the demand to demonstrate what she learned for everything she read. I love recreational reading, and keep trying to lure her back to it. But that is not an easy task. What a sad thing for a librarian and English teacher to have to admit. Fortunately, our older daughter loves reading and shares that love with her students in elementary school and her own children. I am a Third grade teacher and I totally agree! I also highly recommend "The Book Whisperer". It changed my thinking about reading instruction dramatically. At times, all of the demands of the curriculum overwhelm teachers and ultimately the kids. We need to stop, think, and put our students' needs first. One teacher on Pin Interest wrote of abandoning student based reading logs and adopting teacher kept records. I tried that this year with my Year 8 (Victoria, Australia) students, asking them to focus on building their capacity to read for a long time. I would ask them what text they were reading and what page they were up to and keep a record from there. These guys are a tricky age group so I would also ask a random question at random points in the term (whose your favourite character? Whats just happened in your story? What has the bad guy done?) But the poor readers, would 'loose' their books, change their books too many times. And the poorest readers said, " I'm reading the words but not understanding the meaning". One superior reader hardly read anything at all from a book he chose (the life of Pi) and yet when asked to read aloud to me, read confidently and fluently. I think getting students to read is becoming more complicated beyond the need for record keeping. After 15 minutes of free choice reading, my 4th graders have the choice of writing on pen/paper or going onto Edmodo to type about their reading for 5 minutes. Then, they have an additional 10 minutes to read their peers' responses and reply to them. The threaded discussions on paper or Edmodo are reviewed (and sometimes commented on) by me. I agree that when students have choices, they'll enjoy the process and be more engaged with/in the learning journey; and, because they're writing for an authentic audience (their peers), they are writing more words and with details--especially when someone asks for more detail. I have found that students are more engaged readers and writers when they share their experiences with each other. Thank you for sharing your thoughts and the research. After reading for 15 minutes any book of their choice wherever they sit or stretch out, my 4th graders are given the choice to either write on paper or type on Edmodo for approximately 5-10 minutes about their reading. Then, they have an additional 10 minutes to read their classmates' responses and reply to them. I sometimes provide feedback, too. I agree that students who have choices are more engaged in their learning than when they are required to read within their "reading range" or complete an at-home reading log. Through these threaded discussions, I have found my students write more and more words and are engaged in their reading because they are sharing their experiences with an authentic audience (their peers) who are asking for more details, disagreeing respectfully, and/or encouraging the reader/writer! Thank you for sharing your thoughts and the research. High-five! Crystal Hoyt: Wonderful. As an avid reader who grew up to become a librarian, I LOATHED reading logs/sharing in school. For me, reading has always been a very personal experience. I clam up in book group trying to unearth all of the "ah ha" moments I had while reading. Let kids read. If children are struggling, and don't know what to read..suffering through the "there's nothing I like" answer, then send them to the librarian!! Unfortunately we must prepare students for standardized testing. Reading parts of stories or passages and then completing multiple choice or open response answers is always a part of that. Now they are expected to read two different texts and write a comparative essay about them. If we do not model those kinds of activities many student would not only fail but have much greater test anxiety then they already have. I am a math teacher but I see what our ELA teachers are up against with the new PARCC testing heading our way. My son stopped reading too in the 8th and 9th grade because wrestlers and football players teased him mercilessly for always having a book. Because we are told to do this by admin. Literally. Our district instructional specialists have begun doing their own walk thrus to see if we are doing what they put in the district instructional plans. Everybody teach the same thing, on the same day, in the same way, or else! I hate it. It feels like the more I do things 'their' way, the worse I get as a teacher. I cry. Sometimes.....school children must be coerced into doing what they think is dumb. Like the author stated, his son enjoys reading what he wants to read. Is it a good idea to eliminate reading requirements that can measure a student's reading and comprehension skills? Those skills will likely be very important in other future learning experiences, but if a student is only required to read what they "enjoy" reading, they'll be frustrated when they need to be able to read for comprehension. I read the comments (most of the posters appear to be teachers or former teachers) and Runnergirl on 1/04 and Amycrista on 1/05 posted interesting comments. The voluntary student book club sounds good to me. My daughters are polar opposites when it comes to reading. Elizabeth (26) read about 90 books last year while Meredith (23 and in 2nd year of med school) will tell me that she can't read. One reads for fun and the other reads because she must to meet her career goal. We read to both of them every night until they could read to us, so I guess kids are wired differently---always will be. My wife and I have been in the Milton Library history book club for a while and some of the books have been tough to read while others end too soon. We switch from world history one month to US history and as can be expected I'm more fond of the US history subjects, but I always learn about something interesting and important reading those world history books. Please take a minute and see what you think about this program we have developed because we see the very same problems you do. Let's not wait to do something about it. I would love to spread the word about Just Read! O.k how to children prepare for High School if they don't now how to paraphrase or write a book report. How do they prepare for post secondary if they can not take what they read in a text book or what the teacher says and put that on paper. How do they prepare for the workforce and do these same skills we no longer want them to do. A receptionist needs to write what is said in a meeting, a manager needs to write notes to keep track of what is said in a meeting. I feel the more skills they are working on the more likely they will do well in post secondary. A lot of good points here, however, what you don't realize is that it isn't reading logs, teachers, AR or other accountability practices that are killing the love of reading. It's video games and technology. Kids would rather stay up late playing those games than do anything else or watch TV. This has led to very short attention spans, which also make it difficult for a child to settle down and read. This has also affected adults in our society as well. Video game addiction has become a very dangerous thing in our society and losing the love of reading has been one of the symptoms. As an educator and a parent, this post resonated with me. I love the teachers we have entrusted our kids with. Love them. But we are a Nerdy, reading family. And I know I'm growing readers. One took longer than the other to grow, that's okay. But now we are given a reading log for my "longer growing reader." So the choice and excitement is fading, and I see him choosing books to just be done with the requirement. I'm balancing between teaching my Growing Reader to respect what the teacher has asked him to do (he's 8) and knowing him as a reader. It's good stuff to chew on that you presented here. Thanks for putting out there. You are a brave writer. I so agree... perfectly put! I could have written this. I can't tell you how many times I've explained this in reference to my own children. It makes me frustrated and sad being such an avid reader myself. I have blamed the "incentive" programs their elementary school has implemented. Many parents complain but it falls on deaf ears. I try so hard to NOT be this teacher. The balance can be difficult but attainable. Hi, Tony. Thank you for sharing this post! I also admire Kelly Gallagher because his books are full of practical literacy strategies. He inspired me to create a Free Reading Program a few years ago, and over the course of a year, students do start to like reading. A few begin to LOVE it! After doing a survey this semester, my ELs asked that we have more reading time. I then gave them a choice of continue reading past the 10 minutes for 5 more minutes OR they can use the 5 minutes to write about what they read. What did you think most of them did? Yep, most of them decided just to continue reading. I wrote to describe the process of creating a Free Reading Program on this post: http://www.empoweringells.com/2016/08/27/a2-prevent-readicide-with-ells/. It includes videos and photos of the process. I agree with so much of what you wrote here Tony. As a reading specialist my ultimate goal is to help my students become life long readers...not just readers who can pass multiple choice tests. I go out of my way to introduce my struggling readers to authors they might enjoy because if a student doesnt enjoy a book then he/she isn't going to want to read it. If I select a book for one of my reading groups and I notice a lack of enthusiasm for the book I will stop and take it out of their hands and say,"There are so many books we can choose to read, let's find a better one!" The first time I do this my students are always like, "Really? We can do that?" Learning they can put a book down when they find they don't like it is giving them the power of choice. Choice is so important for developing a love for reading...for kids and adults! I also feel the way I present a book can make the difference in a child's attitude towards reading it! If I can introduce a book with a clip from Youtube on the topic I will! If I can offer a graphic novel version of a text to the student who might need the visuals I will! I always ask my kids what they are interested in and I look for reading material on those topics and we read news articles, poems, and plays...not just books. Every day I ask my students what they are reading for fun and if they can't tell me I have them look through my book shelves because I am always buying new books for them to try! I tell them to take it home and see if they get hooked! There are times they will bring the book back and say "Nah, it wasn't good!" But then there are also those days when we have victories, where we found that perfect match and the kid can't put the book down! I love when that happens!